This post doesn’t have much to do with being a non-consumer, but I thought I’d give you a peek into my personal life, and one of my favorite yearly activities: the Jane Austen Ball. 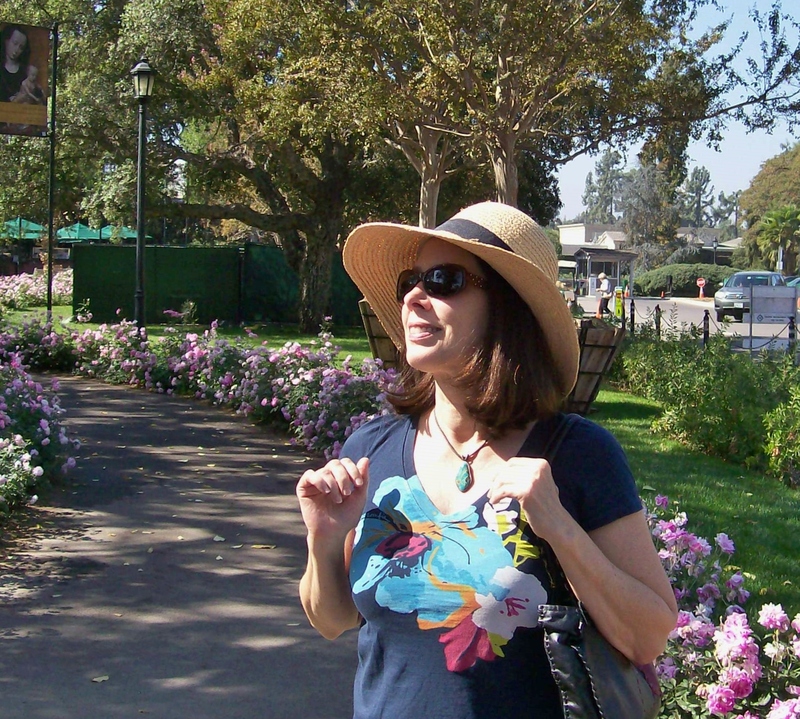 It’s held nearby in Pasadena, and I’ve been attending ever since the very first one in January of 1998. I’ve only missed two due to work (yes, I was actually AT work on a Saturday night, while I was working as an assistant editor on feature films). I don’t miss it if I can help it, it’s great geeky fun! I used to go alone, but my friends David and Colleen have been joining me for the past several years. Colleen comes over early for tea and then she does our hair and we get dressed. I finally had my dress made for me last year, but Colleen made her own dress! The dressing up is fun, but the best part is the dancing. Yes, we do the dances just like you see in the Jane Austen movies. This photo is without a flash, also taken in our living room. And this photo was taken at the dance. Can you tell how I excited I am? I think I look a little scary, like I’m about to burst into a maniacal fit of laughter. Colleen looks so beautiful, and David is so popular at the Ball that we have to beat off the other women to dance with him. As you can imagine, there are always more women than men at the event. Every year I come home so high I can’t go to sleep for hours, and I wake up with the tune to my favorite dance in my head. The name of the dance is “Mr. Beveridge’s Maggot,” I’m not kidding. Apparently the word “maggot” means “whim” in this context. The dance is beautiful to watch and so much fun to dance. I used to rent a dress every year, but last year I finally had one made, so this was the first year that I didn’t have to do anything to get ready the week before. And I only had to spend $30, the cost of the dance, which was well worth it. I don’t know how many cities put on a Jane Austen Ball, but I do know there are groups that do English Country Dancing all across the country. Have you ever been to this type of dance, or a Jane Austen event? I think Jane Austen would be absolutely baffled by the extent of her popularity two centuries later. What a great night out! I see your gloves you bought last year that you 'fessed up re the Compact! What exactly is a Jane Austen Ball? Oh wow!!! That looks like such a FABULOUS night out! I absolutely LOVE Jane Austen!! And you look soo beautiful!! Both dresses are just stunning! I'm pretty sure there's nothing like that here, i'd have heard of it! lol! I'm going to see Pride & Prejudice at The Grand Theater here in March though and i'm sooo excited! I bought tickets for myself, my oldest daughter and my sister. We're all fans! I went to a Ceilih ball (spelling?) which is Scottish dancing- very similar to the country dances in Jane Austen. We had to learn to do them beforehand though- we practiced once a week for a couple of months. How do you learn the dances? I love the dress styles! I wanted my wedding dress to be kind of this style but it ended up being sleeveless, which was a good thing in July. The guy's outfit is great! There's a very fine Jane Austen Ball in Rochester, NY, co-sponsored by the Rochester Country Dancers and the Rochester Region of the Jane Austen Society of North America (JASNA). 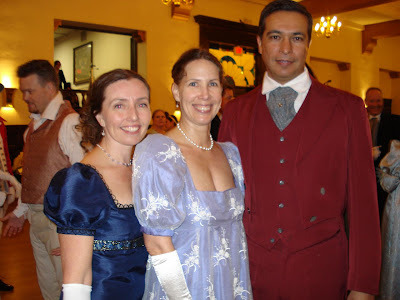 You can find several videos from previous editions of this ball, as well as from the Pasadena Ball, on YouTube (just type "Jane Austen Ball" into the search line). This year's Rochester Ball will be on Sunday, May 2. What fun to go to the Jane Austen ball with your very own handsome Darcy! It's fun to get a peek into your persona life like this, Angela. I had no idea you were such an Austen fan. Becky- It's held at the Pasadena Masonic Lodge on Euclid. There are a lot of lovely old buildings in that area, and it's actually been held a few different places. This one is the best one they've found because there's an area where you can look down on the dance floor when you're "sitting one out." Vanessa- There may be an event in your area, or you can start one! Non Consumer Girl- Yes, those are the gloves I'll wear for as long as I attend the ball. This year I was glad I already had them and didn't have to think about it! Wanda- It's dressing up in Regency attire (although if you don't have it, you can wear any formal attire or for a man just dress pants and a shirt), and doing English Country dancing in the style of Jane Austen's lifetime (early 1800s) to live music- the dancing is so much fun because it's very interactive with everyone around you, but also very beautiful and elegant (mostly). halfdozendaily- that sounds great- have fun! Lomagirl- I learned the basic steps before the very first ball, at about 3 or 4 classes. Now I take one refresher course before the ball. Most of the steps are actually quite easy, just in different orders and arrangements. Marie- I would absolutely love to get a photo of you and your friend- a combination of Thrifty Threads and the Jane Austen Ball- how fantastic. Can't wait to see you in your outfits. Betsy- I do love Jane Austen, I think she's a great wit. I became a fan in my 20s after I got over the idea that her books would be too "girlie." Then they started making the movies in the 90s and for the most part those are fun, but I still love the books best. Jane Austen Book Club was okay, but Pride and Prejudice and Zombies was hilarious- I was laughing out loud so much my husband wouldn't let me bring it to bed. You look very pretty Angela; so do your friends. Thanks for sharing that picture with us! OH my sweet Angela! How elegant and lovely you are! I just watched Northanger Abbey on PBS Sunday and also saw Becoming Jane on Oxygen Saturday night. I LOVE the idea of a Jane Austen ball. So glad you had fun. Balls are so diverting. Angela, I think I love you even more now! One of my dreams is to go to Bath during the Jane Austen Festival. I know I'll get there someday! This ball looks like a good warm up – if only I lived in Pasadena. Marie-Josee- Thank you for the compliment, and the comment. Tammy- Aw, you're so sweet. Really, everyone does look elegant in that type of attire. Now I wish we had gotten a photo with wraps and bags, because I was carrying one of the lace bags you made for me! So pretty! It's funny though- I love the dress but I think it makes me look huge- the high waist thing- and I'm small- not as small as you but smaller than average. Thanks to everyone for your comments! I have to add that I was so amazed when I found out about this ball- it was purely by luck- a coworker was looking for some type of dancing and saw it and knew I loved Jane Austen. So if it's interesting to you, there might be a ball near you or within driving distance for an overnight field trip. It can be a quite non-consumer event once you have a dress to wear every year. Persuaded- Oh, you should go. I doubt if you will look pregnant, or maybe I should say it this way- Regency sort of makes everyone look pregnant. Kristen- Hello! My husband loves it that I go, and takes the photos at home for us, but has no interest in attending. I have slightly piqued his interest this year, in attending as an observer only. It really is fascinating! Thanks for coming by- I can't wait to see your show tonight- I started listening to it at work and it was too loud! That is so cool! I wish we had something like that. I'm a Victorianist by my academic training and a university lecturer and this made me happy. I'll have to show my students next time we cover Austen!